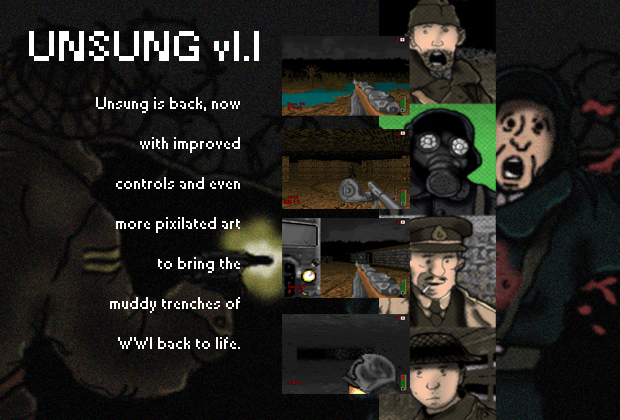 Unsung, a World War I adventure in Wolfenstein 3D, lets you slog through the trenches in true pixelated FPS fashion. Unsung v1.1 for PC. Contains all files necessary to run mod, no installation required. To play unzip files and run unsung.exe. For additional info check the included readme file. being able to strife makes this really enjoyable. Great game even today. One small question remains, can I disable the cross air? What did you made this with? Flash if so I'm really interested in making a game like Doom/like this. A really cool mod, I can imagine it playing really nicely in a doom engine. So I'm going to port it to a doom engine for personal use and add my own small things to it. But loved every bit of it, though I ended up defaulting to playing it on hard because it was too easy for me otherwise. Never, ever any other game gave me such a real and immersive feeling and atmosphere of the WW1's misserable trench warfare. Excellent!